The RS Components Surface Mount Fixed Resistor in a 0102 MELF case offers 12Ohm resistance, ±1% Tolerance and TCR 50PPM/C. 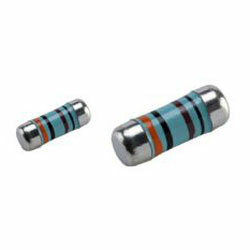 The resistors use Thin Film Technology and are Lead-free. The resistors are automotive standard, meeting AEC-Q200 Qualified approval. The dimensions 1.1mm x 2.2mm with length of 2.2mm. The minimum operating temperature is -55C to a maximum of +155C. The maximum overload voltage provided is 300V, with a minimum temperature coefficient of -50ppm/C. Typical applications include automotive, industrial, telecommunications, medical equipment, and measurement/testing equipment.